STOP PRESS 2:10pm 1 March: DELTA PUBLISHING HAVE AGREED TO DONATE COPIES OF TEACHING UNPLUGGED TO THE SCHOOL IN NEED I WRITE ABOUT IN THIS POST – GREAT TO SEE SOCIAL NETWORKING WORKING FOR SOCIAL GOOD! THANK YOU ALL AT DELTA PUBLISHING!!! Our language school in Christchurch, New Zealand, is preparing to reopen in temporary premises while our building and campus are checked for earthquake damage. We cannot enter our school building to retrieve materials or coursebooks so we are currently engaged in some lateral thinking on how to teach without materials! We won’t have a photocopier or printers or internet access, or whiteboards in our premises. Most of the staff have internet access at home however. Does anyone know of any online articles or pages of ideas for teaching in this type of situation? The students are adults here for general English as well as business English and Cambridge/IELTS exam prep courses. Many thanks in advance for any tips or advice! As you can see, the situation is quite extreme. I am asking on behalf of these teachers and their students for the help of any colleagues who read this posting. comment with ideas or concrete lessons for managing exam preparation classes in the short-term without access to exam prep coursebooks or past papers. When posting, please bear in mind the circumstances; our colleagues in Christchurch have internet access at home or at cafes, but printing and/or photocopying is probably next to impossible. I’ll be tweeting this link soon – please retweet if you can. I’ll make sure that the original poster knows how to find this post and all your comments, so please be generous with your ideas – we’re all in this together. On that note, and being cheeky: DELTA Publishing, any chance of having a few copies of Teaching Unplugged donated to the school in question? Can we work together to make a difference? Comment and let’s get this moving! Thank you for reading, and thank you for helping! Aims: By the end of the lesson, the students will have practiced speaking about something they are prepared to spend extra money (or time) on, and they will have received feedback on the language they used to do this. Think about (and if at all possible, bring in to show) something that you cannot live without and are prepared to spend a relatively large amount of money (or time) on – this could be something very “everyday” such as a $5 hair band (average price 50 cents) or something that you do regularly. Think about what makes this item/activity worth the extra money or time for you personally. Show the students your item (or describe your activity) and tell them about why it is so important for you and why you think it is worth the money or time you spent on it. Welcome questions and be prepared to defend your choice. Ask students to think about something that they spend a little extra money or time on because they think it’s worth it. Point out that it does not need to be an item; it could be a specific service or activity. The only criteria are that they really do spend money or time on this item and you could get the same kind of thing cheaper or faster some other way. Students stand and walk around, finding partners to talk to. They describe their items or services etc and why they feel that it is worth the extra money/time, and listen to each other’s stories. They ask each other for more information and move on, repeating the process with a new partner. Students try to talk to as many people as possible in the time available. Get all the students’ attention (e.g. clap) and tell them to find a new partner. Repeat as necessary. Wander round and encourage students to ask more questions. Whose item/service/activity was most surprising for you? Did anyone’s story convince you to spend more money/time on that thing next time you need it? Ask some students to talk to you about these questions, encourage chat within the group. Hi, here are a few materials-free lessons I’ve been blogging about recently. I hope something here can be of some use. Good luck to you all, with the school at the moment, with the rebuilding in the future. Thanks Ceri – and for your other post. 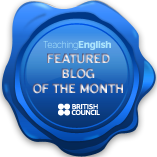 Thought I’d quid pro quo with a lesson idea myself – have updated the post to include it! First suggestion. Ask the students (and listen!). They will surely have many ideas. Get them to help create a syllabus. Getting a few copies of Teaching Unplugged was going to be a suggestion of mine too. If DELTA aren’t forthcoming with some free copies, I’m sure a the school can pick the book up easily themselves. It is highly recommended. To be sure, if the teacher’s have internet access at home, I think, with a little ingenuity, they could actually get through this ordeal very positively. They just need to pool their resources – use their collective classroom experience (you know, what activities usually work well… and why?). I would be very surprised if none of the teachers have already used worksheets and lesson plans from the myriad ELT sites. Collect good ones and discuss their merit. As for exam prep, I can see nothing here stopping those lessons. If at least the teacher’s have access to past papers or coursebook material online. Just mashall some activities that focus on the skills that are to be tested. This is obviously a terrible incident and it especially hit home for me as I was working in Christchurch a few years back (actually hanging out in many of the places that were hit), if anything, this sounds like a great opportunity for the teachers in this school to spread their wings and, if they haven’t already, start teaching unplugged. In fact, quite besides the terrible tragedy here in the town at large, I have to confess I wish I were one those teachers faced with these classroom challenges right now – putting our heads together. I would have a field day. One of my favourite games is what I call “Jenny’s Game” (after the teacher who takes credit for it at my school). All the teacher needs to do is hand out a piece of paper which has been divided into a number to boxes, so the prep is very low. It’s a fun speaking activity which can help with grammar, word order, vocab and memory. It can last up to an hour sometimes and has always gone down a hit in my lessons. Thanks for this one, Miss Fearnley 🙂 This sounds like a great idea that I need to try myself. Thank you for sharing. Hi, here are a few materials-free lesson plans I’ve posted on my blog recently. They are all based on using the student as the main resource. None of them need printing or photocopying. They all work for a wide range of levels. I hope these can be of some help. Good luck with the temporary premises, good luck with the rebuilding. I worked some years back for a great language school in Italy which was affected much like you in the earthquake there in 2009. They have a facebook page : The English School of L’Aquila – they might be the best people to help you, as they’ve been through the same experience. They’re still working in temporary premises but are thriving and are helping to keep a sense of community alive. Thank you Ceri, for this post and for your second one, and for the tip for local support – that’s the kind of generosity I knew was out there. For that last activity you can also get the teachers to come up with sentences that contain mistakes students make often instead of using sentences taken from students’ work. I’ll keep thinking about it and come back if I can think of anything. Best of luck! Warm regards from Brazil. Thank you Cecilia, these are two great ideas! I wish a speedy recovery to all in Christchurch. I have worked in many situations where there is little or no material at all to teach from. You and your colleagues have the advantage of being able to connect to the internet at home and at cafes, so now is the time to make good use of all the ELT bookmarks you’ve collected. As for the test prep materials, I would use what might be available online, I don’t have anything in particular for the DELTA and IELTS. Maybe see what you could get from their websites. I hope this helps. Good luck to you and everyone in Christchurch on the road to recovery! Thanks Scott, I think you have made a very important point: the power of self-organisation and the ability of students to frame their own learning outcomes. Also really like the idea of leveraging the inevitable paperwork which will accompany this crisis. If this were me I’d say become a Gumshoe, get those mobile phones, cameras, paper and pencils, and “press” badges and get out onto the street. Start documenting what you see and hear, and talk to people about their experiences. Before you start, agree with students about the product, the process you will follow to produce it, time frame to completion, milestones, work protocols, and assessment criteria: write rubrics with them and revise the rubrics as you move forward. This is good for any level and any focus. Thanks Mark, this has lots of value – not only linguistic. If internet access can be secured at all, the potential for reaching out with such documentary work could be even more motivating. Some great ideas above – I love Mark’s idea of turning the students into journalists. For something a little more traditional (or old-fashioned?!) but very workable, try a bit of CLL (Community Language Learning) – there’s a good link here about how it works. You just need a recording device (mobile phone will do) and, to carry it through, some paper or a board. Start by brainstorming topics with the students, and then go with the one they’re all happy with. You can tweak the angle, depending on what language you want to draw out / focus on, e.g. something provocative will bring in dis/agreeing; choosing between options or making decisions might encourage language of preference. CLL can be used with all ages, levels groups – GE and BE alike. See the website for some experiences. Thanks Rachel – I think CLL deserves a rehabilitation in this day of mobile media devices: an “old-school” idea with a modern tech twist! Best wished to everybody in Christchurch. Thanks Alan, I’ve seen a lot of great lessons starting this way, always taking new directions! You can teach great lessons at virtually any level by drawing a thought-provoking “stick people” picture on the board and getting groups of learners to decide who the people are, where they are, when it took place and then what happened. The class can vote on their favourite scenario and build the story together or the groups can compete to build their own stories that they then read to the class and everybody votes on their favourite – followed by the teacher using that story for grammar accuracy work. My own fave picture is a very simple drawing of a block of flats with balconies. On the top flat balcony, draw a woman standing with hands on hips and a cross expression and hanging by one arm from the balcony railing draw a man with a surprised expression. However, with the recent earthquake this might not be the best picture to use. Thanks for that simple idea Susie – even wthout a board (which I think is the situation right now) this would work. Wise to consider the appropriateness of any visual you do use, of course! A real tragedy, but perhaps an opportunity as well. I can’t think of a better situation for genuinely unplugged teaching. Good cause, hope a lot of people get involved and support it. I tweeted this last night to my PLN after I saw it on the Dogme list. Thank you for bringing it to our attention. I have stacks of material, but I’m trying to think what might be appropriate to send. Thanks for spreading the word, Simon! 1) Teacher brings in an old / new (depending on budget) newspaper or alternatively asks the learners to bring in an article from a newspaper / website etc… that they are interested in. 2) Divide the class into groups, give each group an article. 3) Ask the learners to prepare 5-10 exam style questions on the article. 4) They then swop articles and questions with another group and attempt to answer them. Then swop again if they’re not fed up! If past exam papers are online the teacher could have a look beforehand at home and prep a list of types / styles of questions that come up to help in stage 3. Thanks Anna, this is a simple but effective way of managing reading/use of English style exam practice without access to past papers! I’m the teacher in Christchurch who originally made this request – just wanted to say a big thank you to everyone who has posted here and elsewhere with advice, tips and ideas. It’s all appreciated and all being read and used! Many thanks to Anthony for posting and all of the contributors for their ideas. If you have a mailing address for your school, there may be other publishers, certainly ELT writers who might be willing to send you material. Is the postal service working? If you’d like to get in touch directly, you can tweet me on @simongreenall, and I’d be please to suggest this to other colleagues. getting students to create their own listening comprehensions has always gone down well with my students. The topic would depend on their level and the teaching setting of course, but I have used topics such as autobiographical info, recipes, a what’s on guide (perhaps not in this case), plans for the future, anything relevant to their lives really. Students work in groups to plan what they’re going to say (a good idea to encourage them not to make it too long), I normally then get them to record themselves, you could get them to write it down and read it out or use mobile phone voice recorders. They then write their own comp questions and make sure they note down the answers too. Then have a carousel activity with the class in groups moving round so they listen to at least two of their classmates’ work and answer the questions. Follow up with a discussion on how it went, was it easier, more difficult than course book listening comp. If we’ve done recipes, we might vote on the best etc. Great to see so many ideas coming in. Great illustration of how “home-baked” receptive work can be fuelled by productive work – thank you, Francine! Individuals write a name of a person or a job title on one sheet, a name of another person or job title on a second sheet, a place on a third sheet and an object on a 4th sheet. The teacher collects up the sheets into envelopes labelled person 1, person 2, where?, what? 3) open class speaking activity where nominated students continue a story by the first student introducing “person 1” and so on. The teacher can then use the students’ work to develop grammar points, vocab etc. Thank you for this, Susie – I like the “one way in – several ways out” style of this. Makes it very easy to use the same idea many times!